Guangzhou ChinaV Inflatable Co.,Ltd.Is aÂ leadingÂ Â inflatable manufacture.We have more than 10 years of experience in developing and producing.Our professional team dedicated to design and produce the safe, quality, amusing and innovative inflatable products with tenet"integrity first, qualityÂ Â first"
Our main product include inflatable jumping castle, inflatable slide, inflatable water park, inflatable swimming pool, inflatable combo, inflatable tent, inflatable arch, inflatable advertising, inflatable boat and other all inflatable products you need ,Â we can custom it according to your requirement. Colour As picture or customized. 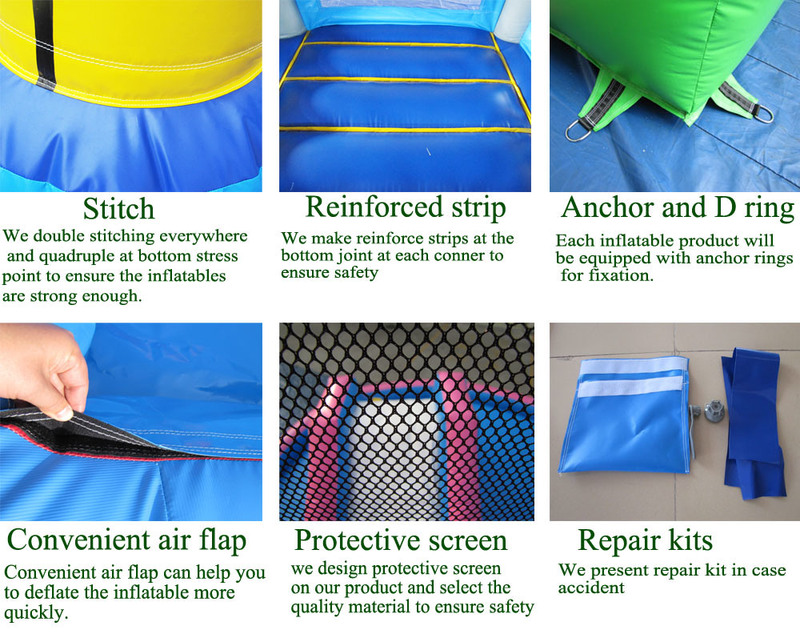 Our inflatable products access to SGS, TUV, Intertek no lead and fire retarding certificates, safe design with high wall and protect net. We are manufacture and have our own factory ,Â calcumulate the price base on the cost accurately. Arrange your order directly to our produce department and keep following up.Our factory is about 30min far to Huangpu port ,Â save freight and deliver conveniently. 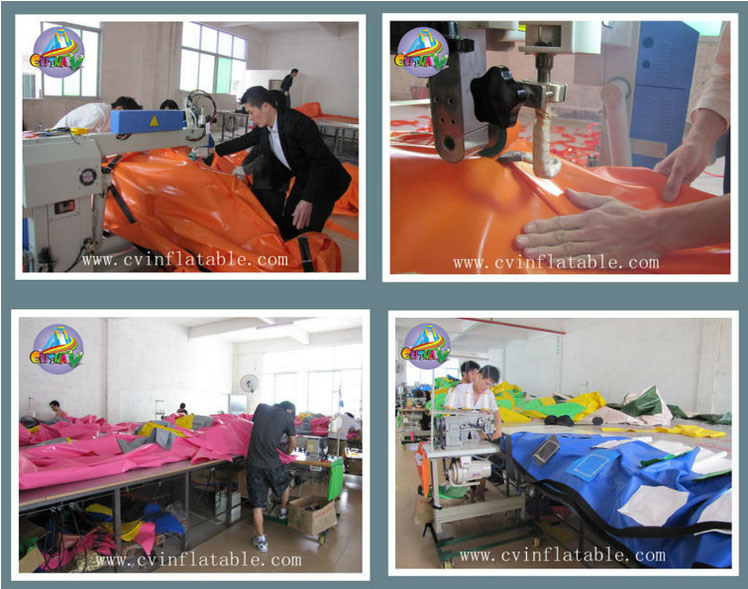 Guangzhou ChinaV Inflatable Co.,Ltd.Always concentrated on quality, we make double stitching everywhere, and quadruple at bottom stress point to ensure the inflatables durable. At the bottomÂ joint and each conner, we will make reinforce strips, so you no need to worry about the safety when kids jumping. At the bottom or everywhere if needed, we will equipped with BucklesÂ rings for fixation. 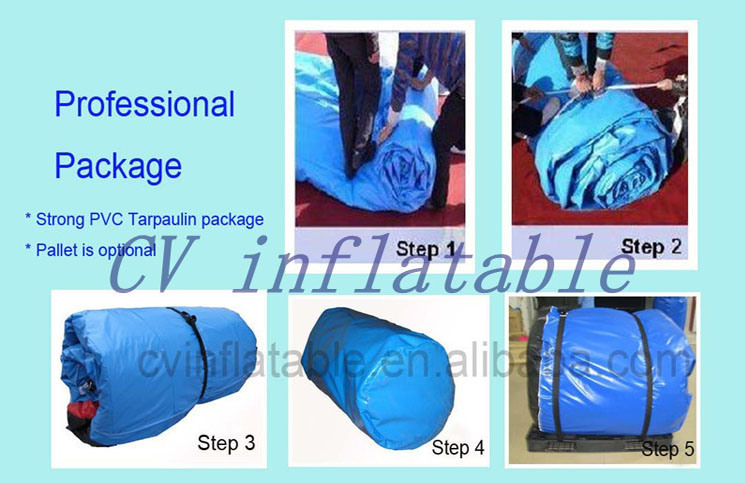 Convenient air flap can help you to deflate the inflatable more quickly. Digital printing, silk printing, or hand painting will be used depend on the design, moreover, we will make aÂ liquid protecting film on the surface of theÂ digital printingÂ so that it will not be sticky even though aÂ long time. 1. What is the warranty year ? Â It is 1 year and 3-5 years working life ! We will offer repair kits for free togther with goods ,you also can repair it by yourself if it is broken.It is very easy to handle with it ,if you don`t know how to repair it ,please email or call us ,we will teach you how to handle with it . Â 2.What is shipping cost ? Regarding the shipping cost ,if you goods is more than 100 kgs ,you also not urgently need it ,yo u can choose by sea ,it will be cheap.Please advise the sea port name,then we can offer you exact price.If you goods is less than 100kgs,you also urgently need it ,please choose by DHL or UPS or FedEx or Special line.But don`t worry about it ,we will help you find most favorable shipping lines. We will use the high quality pvc bag ,it will be more strong enough for the goods in the transit and prevent it from damaged. Â Our products are through CE certification,it meetÂ Europ standard . 5.How can install it ? It is very easy to handle with it .We will offer you manual and it will teach you how to install it and what you should note . 6.How long is it inflatable Â ? Generally it need 5-10 minutes ,it is also depend on the size of the goods . 7.what is the payment ? We accept T/T ,Western Union ,Paypal and Escrow. NEO CHAIR is a Baby High Chair fit for children from 6 months to 6 years old, it is a kind Multi-Functional High Chair that can be detached by table and chair separately, also it is convinent to install and storage. Global kids use imported PP and HDPE material to ensure the products strong enough to keep all children's safety.